Artwork of Bull Wario from Wario Land: Super Mario Land 3. Power(s) given Becomes able to break blocks in one hit and do Ground Pounds. 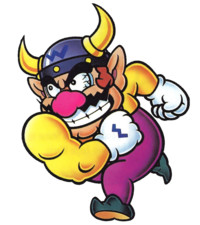 Bull Wario is a form Wario takes after getting a Bull Pot (or Garlic Pot unless he is small) in the game Wario Land: Super Mario Land 3. In this form, Wario can destroy blocks with just one Body Slam instead of two, and is able to do a ground pound that destroys any enemy or block directly hit and creates a shock wave that stuns any nearby enemy. He is also able to stick to the ceiling with his horns. Wario can get this power in Virtual Boy Wario Land via a Viking helmet, or by getting another garlic bottle once already in his normal form. The power works very differently compared to the Wario Land: Super Mario Land 3 version as it simply changes Wario's Barge to resemble a ground pound. However, this is one of the heaviest forms, making it hard to jump out of quicksand. The artwork for Bull Wario can be seen on Wario Shipyard in Mario Kart 7. ↑ Wario Land: Super Mario Land 3 English instruction booklet, pages 11, 12 and 14. ↑ Virtual Boy Wario Land English instruction booklet, pages 23 and 27. ↑ Super Mario Land 3: Wario Land Japanese instruction booklet, pages 11 and 13. ↑ Virtual Boy Wario Land: Awazon no Hihō Japanese instruction booklet, pages 19 and 23. This page was last edited on April 24, 2019, at 12:51.